Every once in a while when trying to download a new app, Apple will ask you to answer the security questions you set a long time ago to keep anyone from hacking into your account. However, I bet you didn’t expect that they would keep you out of your own account did you? 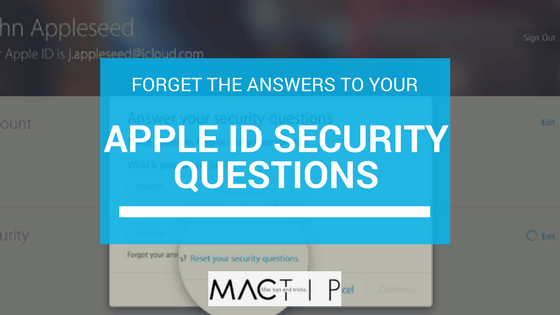 So what should you do if you forget the answers to your Apple ID security questions? Or should I ask, what do you do when you forget the answers AND you no longer have access to the recovery email account that is linked to your Apple account? Unfortunately, this happens all too often. It is incredibly irritating and inconvenient when this happens. Perhaps you have forgotten the password to your recovery email account, or maybe you have deleted it for one reason or another. Whatever the case may be, it is important that you know how to fix it. Luckily there is an easy, straightforward solution. All you have to do is get in touch with Apple Support and ask them for help with your Apple ID Account Security. Simply start by clicking this link and find the Apple Support page for your country. Once you’ve found it, click ‘Start Your Support Request Online’. 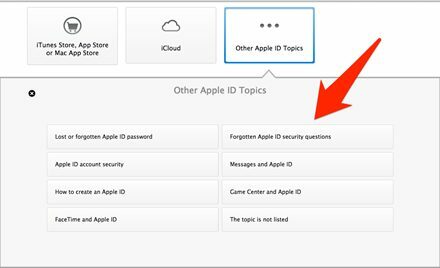 You will then be given a list of Apple ID security-related issues and should choose the one closest to the issue you are experiencing, which would be ‘Forgotten Apple ID security questions’. After this, you will then follow the on-screen prompts and you will get the options to either call Apple Support right away or to schedule a call for later. Once you are on the phone with Apple Support, they will ask you a series of questions to establish that you are, in fact, the actual owner of the Apple ID in question and then they will help you reset the security questions. You can also just call in to Apple Support and describe the issue at hand and ask to be put through to the team that handles Apple ID security issues. The supportive staff can guide you through the process to recover your access and log in to your account quickly. Neither of these options should take too long and are rather easily accessible. As unfortunate and inconvenient as this issue can be, it is able to be resolved quickly and easily. The team at Apple Support is friendly and reliable and will do whatever they can in order to help you resolve this issue. It simply takes some patience and reaching out to the team at Apple Support in order to iron out this annoyance and get you back up and running. While it is an annoyance to have to go through this, it is to preserve the safety of your account and assure that no one else has access to it. It also may be a good idea to write down the answers to your new security questions. Quick tip: How to check webpage for changes with Check4Change Firefox extension. Use widescreen space more efficiently by moving the dock to the side.